MC Property Maintenance provide a wide range of high level access platforms and cherry pickers for hire across Winchester and the rest of the South East where required. With a team of experienced, licensed professionals, we are able to provide expert assistance on both short term and long term cherry pickers for hire as well as providing our own operators where needed. With self-drive truck mounted, trailer mounted and narrow tracked spider lifts available for hire, we have helped with a number of painting and decorating projects in Winchester for both commercial and residential properties. With the hire of a cherry picker, clients are given a cost effective and less intrusive alternative to scaffolding when conducting maintenance, building or cleaning works on the interior or exterior of a building. 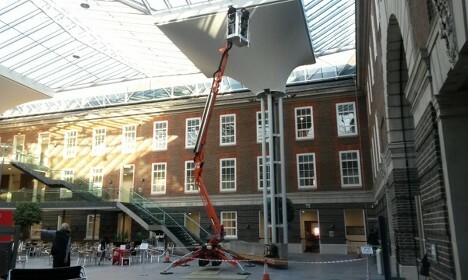 Cherry pickers are versatile machines and can be used in factories, at construction sites and even in churches and shopping centres where needed. The professional team at MC Property Maintenance can offer expert advice on the best type of high level access machinery for your particular project. Based in Bognor Regis, MC Property Maintenance provide a range of different high level access platforms for hire to both large and small organisations, commercial businesses and residential clients looking at painting and decorating their premises. With extensive experience working across Winchester and the surrounding areas, MC Property Maintenance can provide expert advice in the management and organisation of painting and decorating projects as well as assisting in building projects where requested. We have an exquisite track record of providing exactly what our clients need over the years and as an IPAF and CPA accredited company, we ensure complete peace of mind in our high quality standard of service. Choose a high level access platform for hire from MC Property Maintenance and be safe in the quality and experience of our workers and equipment at all times. Self Hire – Our self hire service is available on a long term or short term basis and consists of a team member delivering the machine to your location and helping you to familiarise yourself with the machinery. We provide a range of different high level access platforms including the TRACCESS 170, EASYLIFT R-160, CTE-ZED 21, EASYLIFT R-180 and the EASYLIFT R-150 for hire. Operated Hire – MC Property Maintenance provide operated high level access platforms for hire for commercial and residential building projects. Our operated hire provides a cost effective solution for long term projects as it ensures there is always a professional onsite to provide useful advice on the best use of the machine. Property Maintenance – MC Property Maintenance also provide a range of additional property services in order to ensure the continued upkeep and maintenance of your commercial or residential property. With services such as high level access painting and decorating, the treating of woodwork and gutter cleaning provided, we can ensure the longevity and condition of your property for many years to come. For more information on the range of services we provide clients in Winchester and the surrounding areas, you can easily get in touch with MC Property Maintenance today. Call us on 01243 262714 to speak to a member of our professional team, or email us by filling out the contact form below or on the sidebar to the right and we will be in touch. We hope to hear from you soon.